Paneer tikka masala is a vegetarain’s delight. 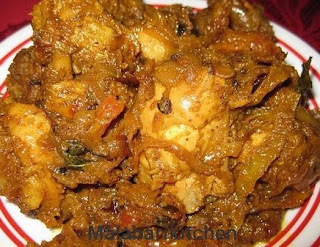 It is a gourmet dish which is very simple to make. Here is a very delicious, spicy, tempting paneer recipe. All ingredients are available in home. Paneer can be bought from any Indian store. =►Mix together curd, turmeric (¼), chilly (1), coriander (½), garam masala and ginger in a bowl. 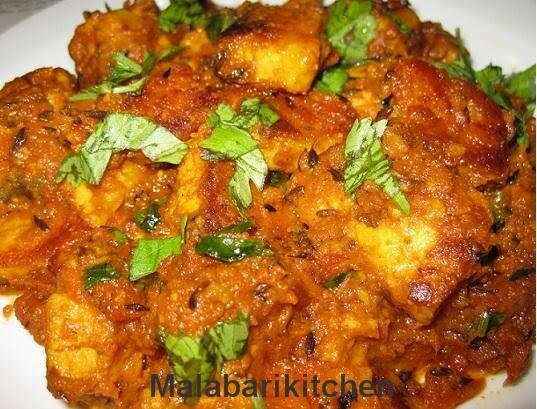 =►Marinate paneer cubes with above mixture. Cover it and leave to marinate for an hour in refrigerator. =►Blend tomato and green chilies to make a puree and keep it aside. =►Heat 2tsp of oil in a frying pan put paneer into it and fry it till the paneer gets light brown (2-3min). =►Take out paneer from the pan and keep it aside. =► Use the same pan for making gravy. Add 1tsp of oil into the pan. 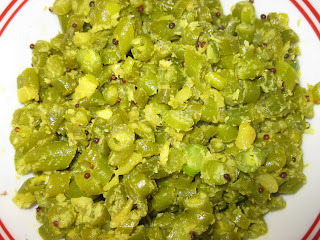 =►Put cumin seeds and when it cracks add curry leaves, bay leaves into it and sauté it well. =►Add tomatos puree (grinded mixture) and mix it well. =►When it is boiling add fenugreek leaves, turmeric, chilly (1), coriander (3/4), cumin powder,salt and garam masala into it. =►Allow it cook for 3-4 min on medium flame. Add fried paneer into it. =►Mix it properly and cook for 3-4 min.Add butter and switch off the flame. =►Garnish it with chopped cilantro leaves.